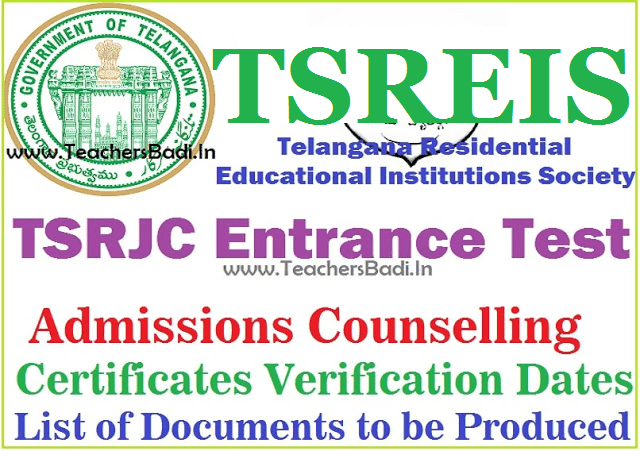 List of candidates shortlisted for 3rd phase counseling / TSRJC CET final phase admissions counselling, Certificates verification dates, Call Letter 2019, shortlisted candidates and list of Documents to be produced at the time of verification: Telangana Residential Educational Institutions Society had released the TSRJC CET 2019 notification in March, 2019 and Online applications were received as per the schedule 2019 ( from ..-03-2019 to ..-04-2019) from the eligible candidates who were appeared the SSC March 2019 exams from Telangana for admission into 1st year intermediate in TSR Junior Colleges for the academic year 2019-2020. The TSRJC Entrance exam was conducted on May ..., 2019 from 10 AM to 12.30 PM and results were declared on ...-05-2019. The candidates who were appeared this entrance exam, they were checked the results. TREI Society has conducted common entrance test on 12.05.2019 for admission of students into I year Intermediate in (04) TSR Junior Colleges and the results are also released. Candidates are shortlisted to attend the admission counselling based on the merit in the entrance test and rule of reservation. Candidates are called for in the ratio of 1:5 in all the categories for the available seats. All the shortlisted candidates were informed through SMS. The TREIS official to be prepared the shortlisted candidates and kept on its web portal. So, the Hall ticket Numbers of the shortlisted candidates for counselling are available on the websites: www.tresidential.cgg.gov.in, http://tsrjdc.cgg.gov.in. Candidates to be shortlisted based on merit in the Entrance Test. Candidates will be called for counselling as per schedule for allotment of seats for admission in the ratio of 1:5. The counselling will start from 10 AM. Filling up of left over vacancies after 2nd counseling in 1st year Intermediate in TSRJCs for the Academic year 2019-2020 through counseling. The shortlisted candidates have been intimated through bulk SMSs to attend the admission counseling along with original certificates listed below. As the applications are received through online and candidates are shortlisted based on the merit along with community reservation mentioned in their application form, verification of certificates is essential for confirmation of admission to the meritorious candidates. Following instructions are issued to the candidates who are attending admissions counseling:Candidates are called for admission counseling in the ratio of 1:4 in all the categories to the available seats. Hence, admission is not assured for all shortlisted candidates. Admission will be provided based on the merit, rule of reservation. The candidate must have Passed in the qualifying examination in the first attempt in March 2019. OC candidates must secure minimum of GPA 6 and BC, SC, ST candidates must secure minimum of GPA 5 in SSC or equivalent Examination. Telugu Medium candidates opting for English Medium should get minimum of GPA 5 in English subject in their qualifying examination i.e. SSC. iv. Permanent Caste Certificate issued by the Tahsildar concerned for B.C., S.C. and S.T.Students. v. Physical Fitness Certificate from Medical Officer not below the rank of Civil Assistant Surgeon. viii.Three Sets of photocopies of all the above certificates. i. PHYSICALLY HANDICAPPED: A Certificate from the Orthopedic Surgeon of the Govt. Hospital (Minimum disability – 40%). iv. Maintenance charges: Rs.1000-00 per annum for all candidates. The candidate along with his/her Parent has to report to the Convener at Counseling venue on the above mentioned date. Counseling will commence at 10.00 AM. Candidate has to report at the venue by 09.30 AM without fail. If he/ she fails to report on the date of counseling, they will not be considered for admission and no further correspondence will be entertained. i. The committee should go through the Information bulletin of TSRJCCET-2019 and understand the rules and other information before the commencement of counseling. ii. Instructions issued above to the candidates are to be observed by the committee in filling up the seats. iii.The registration of candidates attended for counseling shall be taken up from 10.00 am to 1.00 pm. iv. Verification of certificates is to be taken up simultaneously. After satisfactory verification of certificates i.e. SSC marks, Caste, Special reservation category, study certificate and T.C., the eligible candidates in each category shall be listed to call for counseling. v. Verify the certificates pertaining to the category of vacancy in which the candidate is shortlisted. For example, if a candidate is shortlisted against the CAP (Children of Defense personnel) vacancy, then the candidate has to submit the certificates to that extent as he/she mentioned the special reservation category in the application form and selection was made on that information. Similarly in the case of other reservation categories also same procedure is to be followed. vi. If any candidate fails to submit the relevant reservation category certificates, then he/she will not be allowed to participate in the counseling. vii. Counseling shall be commenced at 2.00pm. The candidates, who were shortlisted for I phase Counseling held on ....05.2019 & ....05.2019, but could not secure admission are to be called for in the first instance. After exhausting the list of such candidates only, the candidates shortlisted for II phase are to be called for. Following is the order of priority to be followed in calling the eligible candidates. viii. While calling the candidates for counseling under the reservation categories, the left over candidates under Open Category shall be called first in their respective category of seats and after exhausting the list of leftover candidates only, the candidates listed in reservation category of that particular category shall be called.ix. While filling the vacancies under PHC/CAP/Sports category, if there is any candidate left in that category in open category list, such candidates are to be called before the candidates listed under that reservation category are called. 6. The Principals of Counseling venue TSRJCs are hereby permitted to engage the following staff with the remuneration mentioned against their designation. The Principals of the Counseling centers are hereby instructed to provide accommodation, Drinking Water facilities to the students and parents during their stay for admission. T.A. and D.A. for journey period to the Committee members and other staff drafted for counseling will be allowed as per TA rules in vogue. Date of First counselling for MPC Candidates: .....05.2019.